Now, I’m not in the business of promoting books or products of any kind on this blog, but this is one to seriously consider taking a look at—not just another “manage your pain” book, okay? Bear with me. First of all, it fares high praise from the prestigious magazine for nurses in the United Kingdome, NursingTimes.net. The magazine, and their sister website publish original nursing research and a variety of clinical articles for nurses—and patients on occasion. Manage you pain. 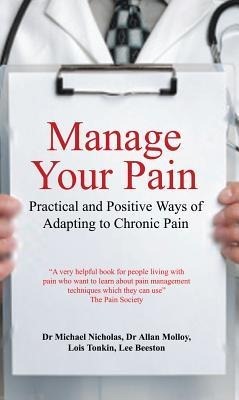 Practical and positive ways of adapting to chronic pain by Dr. Michael Nicholas, Dr. Allan Molloy, Lois Tonkin and Lee Beeston was reviewed by Helen Simkins, clinical nurse manager, St. Giles Walsall Hospice. What’s the book like? Well you can sample it on Amazon, of course, but Nursing Times deems it a guide “that looks at the causes of chronic pain and provides practical solutions for people to implement into their lives, to help reduce the discomfort that they encounter.” Now, I’ve heard all this before. This title allows people who suffer from chronic pain,alternative methods of addressing it. The way the book is set out enables manageable chunks of information to be digested and provides a framework for incorporating practical steps into your everyday life. It provides a message of hope for chronic pain sufferers that they can continue their day-to-day lives and regain the control that they felt they had lost. The book provides alternative and the many holistic ways of addressing the debilitating pain. In short, Dr. Michael Nicholas et. al provide some meaningful suggestions for taking control of your chronic pain. Perhaps even I will check it out.